I realize most people don’t have a pressure cooker — and if they do, they might not use it because it seems kind of scary. But here’s the deal: an electronic pressure cooker can SAVE YOUR LIFE if you’re short on time but love the flavor of slow-cooked meals. 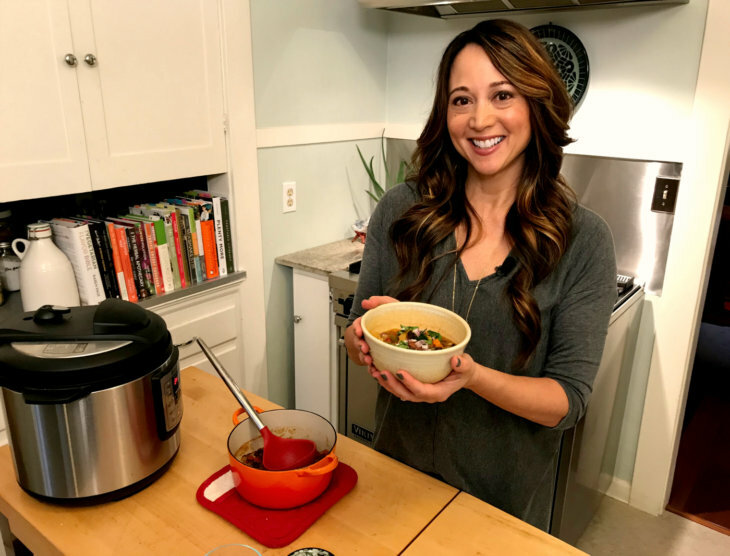 I use my Instant Pot several times a week because you can cook dried, unsoaked beans in less than an hour, and many one-pot meals such as soups and stews can be made even more quickly. Here’s what I especially like about the Instant Pot: once you add all of your ingredients and adjust the settings, you can walk away from it. No stirring or babysitting a pot on the stove. The Instant Pot has you covered. For this recipe, I do a manual release of the steam after the timer goes off. That way, the vegetables don’t get mushy. To do a manual release, just use the long end of a wooden spoon to slide the vent open — this keeps your face and skin far away from any escaping steam. 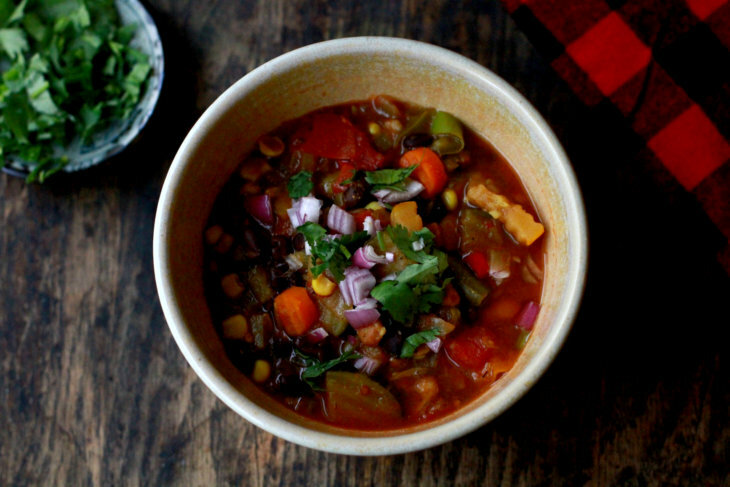 This recipe is inspired by the Texas Two Bean Soup recipe in the Moosewood Restaurant Daily Special cookbook. Set Instant Pot to sauté mode. Water sauté the onion: add the chopped onion to the pot, along with a tablespoon or two of water. Stir frequently, adding a bit of water if the onions get stuck. Sauté until the onions are translucent and starting to brown. Next, add the rest of the ingredients. Give everything a stir to incorporate. Put the lid on the Instant Pot and put it into the locked position. Make sure the valve is set to "sealing" mode. Press the "Keep Warm/Cancel" button on the Instant Pot. Then, press the "manual" button, and decrease the timer setting to 2 minutes. Let the Instant Pot do its work — it'll take 10-15 minutes for the Instant Pot to come up to pressure, and then the timer will begin counting down. Once the timer goes off, use a long spoon handle to open the vent and do a manual release of the steam. Wait until all of the steam is released, then open the lid carefully. Face the lid away from you to minimize any exposure to residual steam. Stir the soup, and add pepper and salt if desired. Serve with your choice of toppings such as chopped cilantro, chopped red onion, hot sauce, etc.